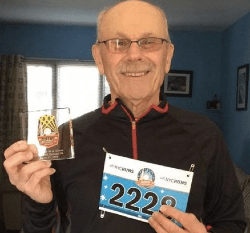 When 78-year-old Michael Schenkman was killed by a speeding motorist on Northern Boulevard last month, he was on his daily ride to Joe Michaels Mile, a bike path that runs for two and a half miles along the Cross Island Parkway. Now business owners and residents in Little Neck and Douglaston are reiterating calls for safe bike access to the popular cycling route. A driver killed Michael Schenkman last month as he attempted to bike to Joe Michaels Mile. Schenkman was riding east at around 6:30 a.m. on August 24 when a driver struck him from behind as he began to merge into the center lane to turn left onto Joe Michaels Mile, according to the Times. Drivers killed eight pedestrians along Northern Boulevard from 2012 to 2014, placing it near the top of the Tri-State Transportation Campaign’s 2016 list of the borough’s “Most Dangerous Roads for Walking.” It is also one of the city’s Vision Zero priority corridors. The city, however, has declined to pursue multiple requests for safer bike connections to Joe Michaels Mile. In 2010, the Douglaston Village Chamber of Commerce set out to make the historic railroad suburb more walkable and bikeable. The chamber’s proposal to connect the neighborhood and bike path via an off-street route failed to gain traction and was ultimately rejected by the Parks Department because of its price tag, according to Victor Dadras, who lives in Little Neck and developed the plan with his firm Downtown Revitalization Group. 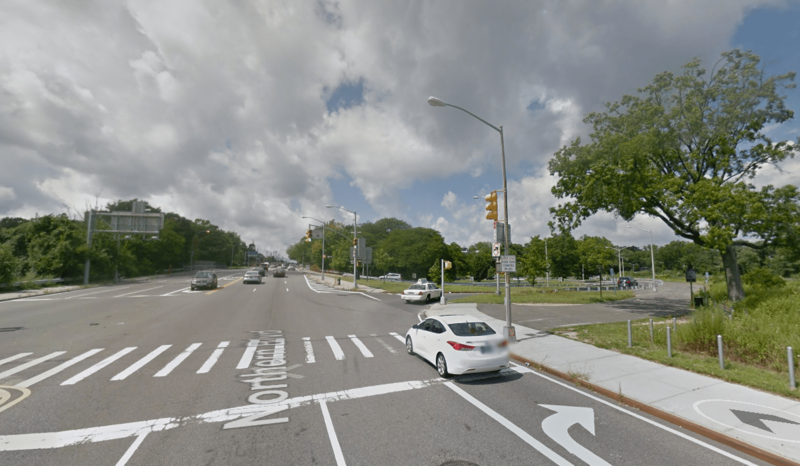 More recently, the Westmoreland Association, which represents around 350 homeowners in the area, requested a bike lane on Northern Boulevard (coming from the opposite direction that Schenkman was traveling) in communications with DOT in January 2014 and Community Board 11 in January 2015. Nearly two years after the DOT request, Queens Borough Commissioner Nicole Garcia said the agency did not have plans to install bike lanes on Northern Boulevard and that such an endeavor would be “challenging” because of “heavy traffic volumes and limited roadway space” [PDF]. Emerson and Dadras both said they plan to attend next Tuesday’s CB 11 meeting to speak out in favor of a safe connection to the path. Historically, however, CB 11 has not supported bike lane projects, opposing a 2011 DOT proposal for a 73rd Avenue bike lane after one business owner on the corridor objected. If you would like to speak up for safer bike infrastructure in the area, next Tuesday’s CB 11 meeting begins at 7:30 p.m. at Middle School 158, located at 46-35 Oceania Street. I recall recent experience trying a left turn on a two way, two lane street in Brooklyn, only to have a driver barrel right at me at full speed with horn blaring. My impression of drivers is that they don’t believe that cyclists have the right to take a left lane or to turn. On anything but a one-way street, I dread doing so. CB11 takes public comments at the start of the meeting. However, you need to make an appointment. Please call 718-225-1054 no later than September 9th. This street design is hilariously bad when compared to the safety rhetoric of the city. There is nothing even remotely safe about any of the streets in the neighborhood. They look like they are designed to kill people, and am sure they are designed to discourage “loitering”. I wouldn’t let that discourage you. If you gotta make a turn, you gotta make a turn. In most cases if you’re not comfortable making a vehicular-style left, you can do it as a 2-stage “ped style turn” instead. Of course, at this location it’s a T and there is nowhere to pull off to wait other than the sidewalk. The half-assed jughandle turn box on the northbound Bowery to make a left onto Spring St at least provides that. I’ve been working on a project along this stretch of Northern blvd. and was detoured the morning of the accident. Drivers do tend to speed through there. I noticed the police pulling a lot of people over for about two days after the accident, then it tapered off again. Such a short memory the police seem to have. I’d have to agree that using the sidewalk is the safest way through there. It doesn’t see many walkers anyway. Not just cyclists should be concerned, for if you are attempting to use this stretch of road (say, to go from Oakland Lake over to Joe Michael’s Mile via 223rd St, on either side of Northern), you take your life into your hands. Drivers seem to be terribly inconvenienced if you wish to cross the road legally, blocking their ability to turn …. Last summer, a speeding motorist struck and killed Michael Schenkman, 78, as Schenkman attempted to turn onto the Joe Michaels Mile bike path, where he rode daily. Now NYC DOT has produced a plan to link Joe Michaels Mile to six miles of on-street protected bike lanes. After a motorist killed 78-year-old cyclist Michael Schenkman, DOT proposed six miles of protected bike lanes on Northern Boulevard and connecting streets. The plan will be the subject of a Queens CB 11 hearing Monday night. As far as Avella is concerned, people who bike and walk on Northern Boulevard just don't count. Last night, Queens Community Board 11 endorsed six miles of new protected bike lanes connecting Joe Michaels Mile to Northern Boulevard and points south, prioritizing safety above the parking complaints aired by some people in attendance. Earlier this year, Queens Community Board 11 voted for a DOT project to create several miles of protected bike lanes linking to the Joe Michaels Mile bike path. There were multiple public meetings about the redesign, but now members of the board are planning a closed meeting on Monday to hear objections to it. The state senator representing eastern Queens wants DOT to halt a safety project where a driver took the life of Michael Schenkman last year.